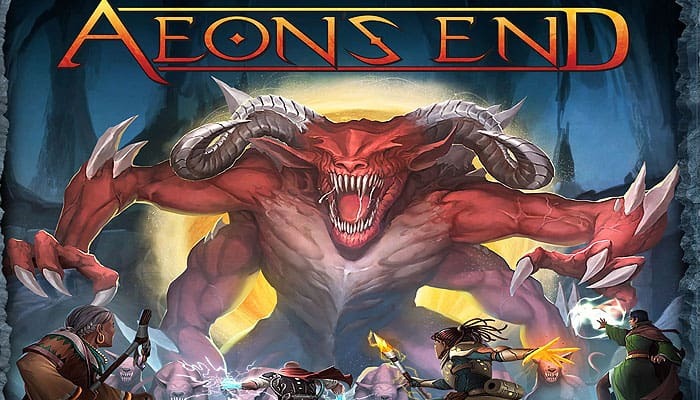 Aeon's End is a cooperative deck building game where your deck is never shuffled. Your goal is to defeat the nemesis before your home, Gravehold, is overrun or the players are exhausted. Each round, the players and the nemesis will take turns in a random order. During a player's turn, they will be able to cast spells, acquire additional gems, relics and spells from the supply, manipulate their spell casting breaches and use their unique abilities. All four of the different nemeses included in the game are unique in the actions taken during their turns, and will require a different strategy to defeat. 40 life tokens: used to track the life of the players and minions. 21 charge tokens: used to fuel players' abilities. 10 power tokens: used to track the number of turns until a power resolves. 2 life dials: used to track the life of Gravehold and the nemesis. 4 player number tokens: placed on player mats and used in conjunction with the turn order cards to determine play order. 87 gem -, 86 spell - ,30 relic cards: used by the players to enhance their decks. 27 randomizer cards: used to determine which player cards are available. 4 player aid cards: used for quick reference of the phases of a turn. 8 player mats: used for tracking the important information of each player. 16 breaches: used by the players to cast their spells. 9 turn order cards: used to determine the order of play during the game. 4 nemesis mats: used to display the specific rules for each nemesis. 75 nemesis cards: used by the nemesis against the players and Gravehold. This page introduces the game components and the game terms used with those components. Please take some time to become familiar with this section before reading the rules. 1 Each player chooses a player mat and a player number token. 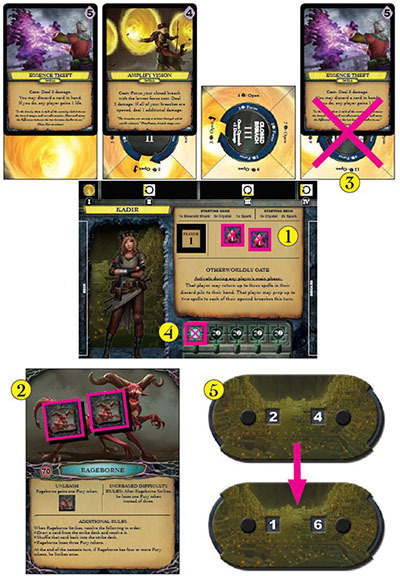 2 Each player builds their starting hand and deck as shown on their player mat. 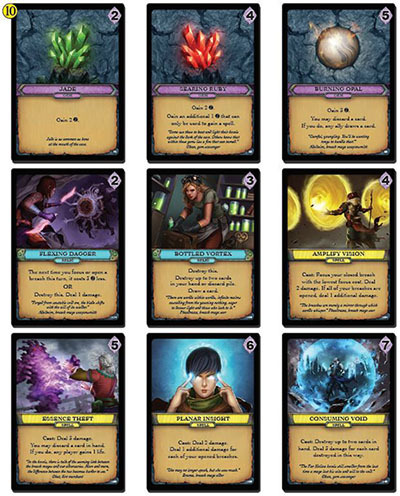 The cards should be in the order shown with the leftmost card(s) being the top card(_) of their deck and the rightmost card(_) being the bottom card(_) of their deck. 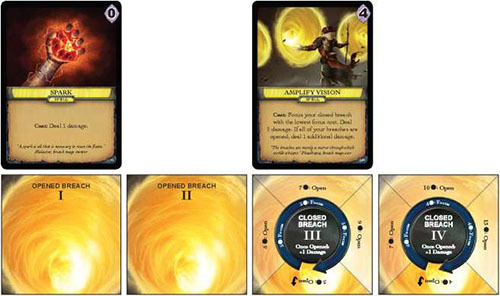 3 Each player receives one of each type of breach shown on their mat (I-IV as listed). Players arrange their breaches as indicated on their player mat. 4 Each player starts the game with 10 life. Set the Gravehold life dial to 30. The players and Gravehold can never have more than their starting life. To differentiate the starter cards from the cards used in the market, the cards used to form your initial hand and deck are denotdd with a in the lower left corner. 5 The turn order deck is always composed of four player turn order cards and two nemesis turn order cards. The player turn order cards correspond to the player number tokens. For two players, place two turn order cards for each player in the deck. For three players, place one turn order card for each player plus the wild turn order card in the deck. When the wild turn order card is drawn, the players decide which one of them will take that turn. The wild turn order card is a player turn order card. For four players, place one turn order card in the deck for each player. Regardless of the player count, add two nemesis turn order cards to the deck and shuffle it. When the turn order deck is empty and a new turn order card must be drawn or revealed, shuffle all of the turn order cards together and place them facedown to make the turn order deck again. 6 Choose a nemesis to play against, and set its nemesis mat near the players. Carefully read all of the additional rules for the chosen nemesis. 7 Set the nemesis life dial equal to the number shown on the nemesis mat. The nemesis can never have more than its starting life. Each nemesis has a set of cards with their name written at the bottom left. In addition to any specific nemesis cards, some basic cards are included in each nemesis deck. The nemesis deck is comprised of between 20 and 31 cards as determined by player count. The nemesis deck has three tiers which increase in difficulty as the game progresses and will consist of both nemesis specific and basic nemesis cards. Tiers are indicated by a 1, 2 or 3 in the bottom right of the nemesis cards. Each nemesis has nine nemesis specific cards with the name of the nemesis written at the bottom left. Locate the nine nemesis specific cards used for this game, and separate them into three piles of three cards according to the card's tier. Use the chart below to add basic nemesis cards to each pile based on the number of players in the game. Shuffle each pile of cards separately. Place the tier 3 cards on bottom facedown, the tier 2 cards facedown on top of the tier 3 cards, and the tier 1 cards facedown on top of the tier 2 cards. Combined, these tiers form the nemesis deck. Do not shuffle the nemesis deck once it has been created. 9 After creating the nemesis deck, follow all Setup instructions written on the back of the nemesis mat. Depending on which nemesis you're playing against, there may be other cards used besides the nemesis deck. These cards are marked as tie273efer to the nemesis mat for specific setup instructions. 10 The supply piles are the player cards that can be gained during the game. The supply is composed of nine supply piles. Each pile contains several copies of the same card. The players can determine these piles randomly, using the randomizer cards, or choose the cards they wish to use. If a supply pile runs out, it is considered empty. Do not replace it. 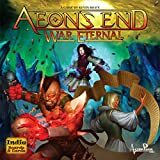 Aeon's End has a variable turn order which is determined by the turn order deck. At the start of the game and after each player or nemesis turn ends, draw a card from the turn order deck to determine who takes the next turn. Place that card on the top of the turn order discard pile. If you need to draw or reveal a card from the turn order deck and that deck is empty, shuffle the discarded turn order cards together facedown to replenish the turn order deck. Now that Abby and Bob have the game set up, they start the game by drawing the top card of the turn order deck. The Player 1 turn order card is drawn, so Abby will take the first turn. On Abby's turn, she will play through the following phases in order: casting phase, main phase, and draw phase. During the casting phase, she will be able to cast spells that she prepped on a previous turn. Since it is the first turn of the game, Abby will skip this phase and move straight to the main phase. You may Cast any of your prepped spells in opened breaches. You must Cast any of your prepped spells in closed breaches. Place cast spells on the top of your discard pile as they are cast. Place all the gems and relics that you have played this turn on the top of your discard pile in any order you choose. Draw cards from the top of your deck until you have five cards in hand. If at any time a player's life is reduced to zero, that player is exhausted. Any spells that are prepped in an opened breach may be Cast during this phase. Every spell prepped in a closed breach (that is, a spell that was prepped to a focused breach in the previous turn) must be Cast now. You choose the order in which you Cast your spells. Discard it to the top of your discard pile immediately, then resolve the effect after the word 'Cast:' on the card. That spell can only deal damage to a single minion or the nemesis unless otherwise specified. Some breaches have a "+1 damage when Cast" effect while they are opened. Any spell Cast from an open breach with this effect deals 1 additional damage, even if that spell's effect would normally not deal damage. To a minion, remove life tokens from that minion card equal to the damage you dealt. If a minion has no life tokens remaining, it is immediately discarded. To the nemesis, reduce its life total on the dial by the amount of damage you dealt. If the nemesis has zero life remaining, the players immediately win. For this example, we have skipped ahead a few turns in the game to a point where Bob has gained a few spells. He starts the turn with a Spark and an Amplify Vision prepped as shown below. His Spark spell is prepped on breach I, which is opened, so he has the option of casting it now or waiting to cast it later. Amplify Vision is prepped on a closed breach III. Since that breach is closed, Amplify Vision must be cast this turn. Bob decides to cast Amplify Vision first. He immediately places the Amplify Vision in his discard pile. Then he resolves the Cast effect - dealing 2 damage to the nemesis. Then he focuses his closed breach with the lowest focus cost. The I and II breaches are open, so he focuses the III breach. He turns that breach 90° clockwise. Finally, Bob decides not to cast the Sparkprepped on an open breach. He wants to save this spell for a future turn and be ready if a minion shows up. 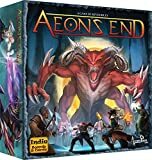 There are some effects in Aeon's End that will allow you to cast another player's prepped spells. When casting a spell other than your own, you are the 'you" referred to on the spell card. You make all decisions pertaining to that spell. For example: You play a Garnet Shard to cast your ally's prepped Dark Fire. You must discard up to two cards fromyour hand (DarkFire's effect) to your discard pile. You also choose either the nemesis or a minion to suffer Dark Fire's damage. The cast Dark Fire spell card is placed on the top of your ally's discard pile. The following eight actions can be done in any order, any number of times during a player's main ph ase. For example, you could play a gem, gain a card, prep a spell, play another gem card, and gain another card. When you play a card, you must execute all of the text on that card, if possible. If there is an "OR,' you choose exactly one of the options listed. If you can only complete one of the two options, you must choose that option. You may gain aether ( ) even if you choose not to spend it. Any aether ( ) gained on a turn that is not spent is lost. Aether does not accumulate over turns, nor can it be given to other players. At the end of your turn, any gem or relic cards you played are placed on top of your discard pile in any order. You may gain a card from the supply by spending aether ( ) you have gained this turn equal to the the cost shown in the upper right-hand corner of the card. When you gain a card, it is immediately placed on top of your discard pile. You may pay 2 aether ( ) to gain a charge. When you gain a charge, place a charge token on your player mat beneath the ability description. You may not pay aether ( ) to gain charges for your allies. You may not have more charges than your ability requires. The maximum charges are denoted by the number of spaces available on the player mat: 4, 5, or 6. Cards gained are immediately placed in your discard pile. Any gem or relic cards that you play are placed in your play area. At the end of your turn, during the draw phase, played gem and relic cards will be placed in your discard pile in any order you choose. You can focus a closed breach by paying the focus cost shown near the center of that breach card. When you focus a breach, rotate the breach card 90° clockwise. You may prep a spell to the focused breach this turn. Breaches may be focused any number of times per turn. Any number of breaches may be focused per turn. You may focus a breach without prepping a spell to it. A breach that has been rotated so that the yellow quadrant is at the top has a focus cost equal to its stated open cost and can be opened by an effect that would otherwise focus this breach. You can open a closed breach by paying the open cost currently indicated on the top of that breach card. The open cost decreases each time you focus the breach. When you open a breach, flip the breach to the opened side. Opened breaches stay opened for the rest of the game. A spell can be prepped to a breach on the turn that breach is opened and any subsequent turn. To prep a spell, play a spell card onto an opened breach or a closed breach that has been focused this turn. Only one spell may be prepped to a breach at a time. You cannot prep a spell to a breach that already has a prepped spell. Prepped spells can be Cast during the casting phase of that player's next turn. For this example, we'll jump ahead to Abby's second turn. She has three Crystals and two Sparks in her hand. It is her main phase. She has only one open breach, so she will need to either open or focus another breach if she wishes to prep both of her spells. You can use the effect of any of your prepped spells that have a "While prepped" effect that is specific to the main ph ase. Such effects may be used on the turn that the spell is prepped or any subsequent turn if the spell is still prepped. Some "While prepped" effects do not occur during the main ph ase. Each "While prepped" effect may be used once per turn. Some nemesis power cards have a "TO DISCARD:" effect. During your main phase, you may fully resolve the effect listed to discard that power card. If a power card is discarded this way, its effect is not resolved. Once you have finished your main phase, place all of the gem and relic cards you played this turn on top of your discard pile in any order. Then, keeping all unplayed cards in hand, draw cards from the top of your deck until you have five cards in hand. If at any time there are not enough cards in your deck to draw or reveal a card, draw/reveal as many as you can then flip over your discard pile to form a new deck and draw/reveal. At no point in the game do you shuffle your deck. You may not choose to discard cards during your turn. Unlike other deck builders, you do not discard your hand at the end of each turn. You may look through your discard pile at any time, although you may not rearrange it. You may not look through your deck. There is no maximum hand size. Unlike many other deckbuilding games, you do not shuffle your discard pile when your deck is empty. Simply flip your discard pile over to form your deck. It is the end of one of Bob's turns. During his casting phase, he Cast an Amplify Vision, which was immediately placed on top of his discard pile. On this turn, he played a Flexing Dagger, three Crystals, and a Jade. He used the Flexing Dagger to focus his III breach. He used the 5 from the Jade and the Crystals to gain an Essence Theft. When he gained the Essence Theft, he placed it directly on top of the Amplify Vision in his discard pile. Bob is now done with his main phase. At the start of his draw phase, he places the Flexing Dagger, the Crystals, and the Jade on top of his discard pile in any order. Bob chooses toplace the Dagger first, then the Jade, and finally all of the Crystals. Next, Bob draws cards from the top of his deckuntil he has five cards in hand. His deck only has two cards in it. Bob draws those two and then, without shuffling, flips his discard pile over to form his new deck. He then draws three more cards so that he has five cards in hand. From oldest to newest, resolve the effects of each minion and power card the nemesis has in play. Draw a card from the nemesis deck. If it is an attack card, resolve its effect immediately. If it is a minion card or power card, place it into play with the appropriate number of life or power tokens. Resolve any effects following "IMMEDIATELY:" on the card. The rest of its effects will not be resolved this turn. Starting with the minion card or power card that has been in play the longest, the players will resolve the effects of each minion card and power card in play. PERSISTENT effects are resolved now. Each power card in play will lose 1 power token. After removing a token, if a power card has no tokens on it, resolve the effect that is shown after "POWER X:" and discard it from play. If the nemesis deck is empty and the nemesis would draw a card, instead Unleash three times. Resolve the card's effect immediately in the order that it appears on the card. Then, place the card in the nemesis's discard pile. Execute any effect that follows the word "IMMEDIATELY:". 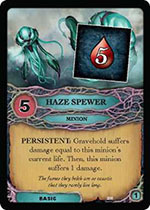 Then place the minion card into play with the number of life tokens indicated on the card. Execute any effect that follows the word "IMMEDIATELY:" Then place the power card into play with a number of power tokens as indicated on the card. When resolving an effect that cannot be fully completed, resolve as much as possible. If you are given an option between two effects, you must choose an option you can fully resolve. Persistent and power effects only occur during the nemesis's main ph ase. These effects are ignored for newly placed minion and power cards until the nemesis' next turn. Nemesis cards may have ambiguous situations where it's not clear what or who should be affected. In these cases the players make that determination. For example, if you are resolving a nemesis card that makes the player with the lowest life suffer damage and two players are tied for having the lowest life, the players decide who suffers the damage. Another card may have the player with the most charges suffer damage when no players have any charges. In this case also, the players choose who will suffer the damage. After fully resolving the nemesis main phase, Abby and Bob proceed to the nemesis draw phase. During this phase, they will draw a card from the nemesis deck and resolve it. Here are examples of the three types of nemesis cards, along with how they would be resolved. In this example, Abby and Bob draw Slaughter, an attack card, from Rageborne's nemesis deck. Attack cards resolve immediately. Slaugther's effect is "Unleash. Gravehold suffers 3 damage". Rageborne's Unleash effect is "Rageborne gains 1 Fury token. " Abby adds a Fury token to Rageborne. Then, Bob adjusts Gravehold's life counter down 3 life from 27 to 24. 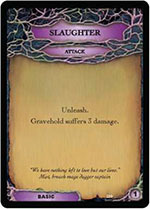 Finally, Slaughter is discarded to the nemesis discard pile. 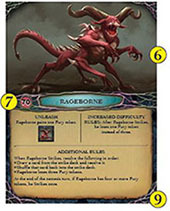 In this example, Abby and Bob draw Haze Spewer, a minion card, from Rageborne's nemesis deck. Haze Spewer is a minion with no immediate effect, so it is placed into play. It has 5 life, so Abby and Bob place a 5 life token on it. They also read Haze Spewer's persistent effect so they know what will happen during the next nemesis main phase. This effect doesn't resolve this turn because persistent effects are only resolved during the nemesis main phase, which has already passed. In this example, Abby and Bob draw Eye of Nothing, a power card, from Rageborne's nemesis deck. 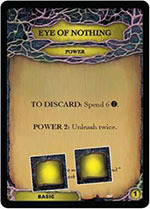 Since Eye of Nothing is a power card, it is placed directly into play. It has a power of 2. Therefore, Abby and Bob place two power tokens on it. It has no immediate effect, so there is nothing else that Abby and Bob have to resolve this turn. They read the card's effect so they know what it will do when it resolves. Power tokens are removed and powers resolve during the nemesis main phase - neither of these actions will happen this turn as the nemesis main phase has already passed. Eye of Nothing has a "TO DISCARD:'' effect. Any player may resolve the effect listed here during their main phase to discard thatpower card. If a player's life is reduced to zero, that player is exhausted. Resolve the following effects in order. Resolve the nemesis's Unleash effect twice. The exhausted player destroys one of their breaches, discarding any spell prepped in that breach. Destroyed breaches can be returned to the box - there is no way to regain a destroyed breach. The remaining breaches stay in their current positions. The exhausted player discards all of their charge tokens. Exhausted players cannot gain life. When a card deals damage to the player with the lowest life, it always deals that damage to the non-exhausted player with the lowest current life. When an exhausted player suffers damage, instead deal twice that amount of damage to Gravehold. This includes excess damage when a player initially becomes exhausted. If all players become exhausted, the game ends immediately and the players lose. An ally is any player other than you. Cards which are destroyed are permanently removed from the game and are not used or interacted with in any way once they are destroyed. When a card gives two options separated by an "OR ", you may choose either option, unless you cannot fully resolve one of them. In that case, you must choose the effect that you can fully resolve. Some nemesis power cards have "TO DISCARD:'' effects on them. During a player's main phase, that player may resolve the text following "TO DISCARD:" to discard that power card from play. If a player does discard a power card this way, that card has no effect. Some nemesis cards will say "Unleash". Each nemesis has a unique effect that is resolved when this happens. This effect is listed on each nemesis mat. Laterin the game during the Nemesis Main Phase, Bleed Static's effect (The player with the most prepped spells suffers 2 damage for each of their prepped spells). is resolved. 2 Resolves Rageborne's Unleash effect twice. Rageborne gains 2 Fury tokens. 3 Destroys her IV breach and discards the spell that was prepped on it. 4 Discards all her charge tokens. 5 The remaining 4 damage is doubled and suffered by Gravehold. She adjusts the Gravehold life counter down from 24 to 16. In all situations, when an end game condition is met, gameplay ends immediately without further resolution of effects. The nemesis has no cards in its deck and no minions or powers in play. The nemesis has 0 life. All the players are exhausted (have 0 life). 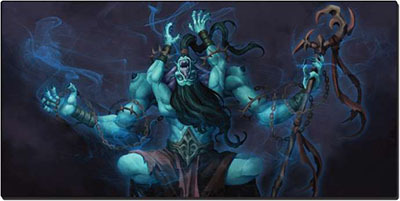 In addition, a nemesis may have a specific victory condition listed on the nemesis mat that causes the players to lose immediately.